The Elections Board has permitted two more candidates who missed the registration deadline to run in the Spring 2018 student government elections, according to Chair of the Elections Board Betty Zhang (20C). College Council (CC) Vice President of Administration Radhika Kadakia (20C) failed to declare her candidacy for CC president by March 18 at 11:59 p.m., but the Elections Board allowed her to run because it mistakenly thought that the race would have otherwise been uncontested. Zhang also told the Wheel that the Board did not want to prohibit Kadakia’s candidacy after it had already allowed Student Government Association (SGA) presidential candidate Mario Karras (17Ox, 19B) to run despite his late declaration, which he attributed to poor Wi-Fi connectivity when traveling in Egypt. CC Freshman Legislator Karen Lee (21C) failed to declare her candidacy for CC sophomore representative by the deadline because members of the Elections Board did not provide her with the registration form on time. Zhang and Vice-Chair of the Elections Board Andy Xu (20C) allowed Lee to run without consulting the Board. CC Vice President Naman Jain (18C) spoke with Zhang to persuade the Elections Board to allow Kadakia to declare her candidacy late, claiming there was only one other CC presidential candidate at the time, Tiffany Haas (19C). 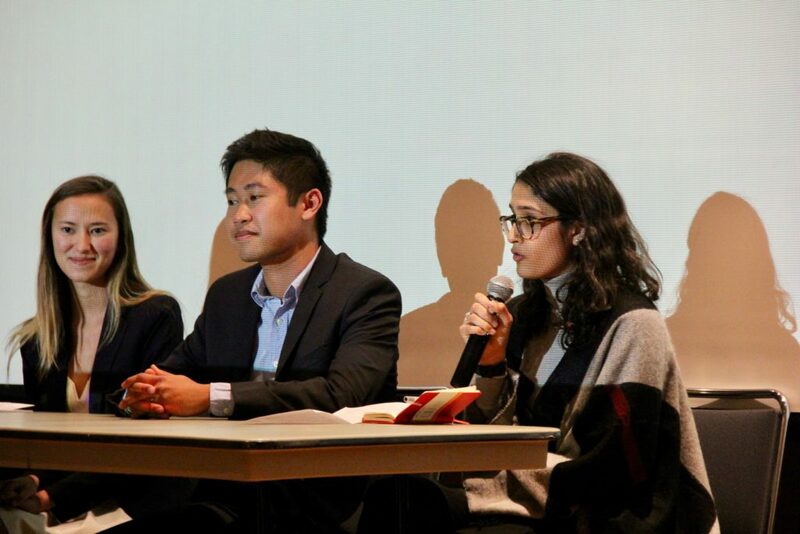 Jain told Zhang that CC leaders wanted the race to be contested and that he was advocating on behalf of CC President Cassidy Schwartz (18C), CC Adviser Sarah Beth Potter and CC executive board members, according to both Zhang and Jain. However, Jain and other CC leaders were unaware that Paolo Mutia (19C), a former Oxford SGA attorney general, had also registered his candidacy for CC president before the deadline. Zhang did not independently verify that there were no other candidates running against Haas, she told the Wheel. When Zhang presented Kadakia’s case to the Elections Board, she told Board members that Haas was the only candidate in the CC presidential race, according to Elections Board member Jesse Wang (18B). The Elections Board voted 5-0 to approve Kadakia’s candidacy after she “forgot to submit” by the registration deadline, according to Zhang. She officially declared Monday night, one day after the deadline, Zhang said. Wang said that his decision to allow Kadakia to run was based on the belief that the election would have been uncontested if they did not allow her to run. “The reason I voted for [Kadakia] to be able to run is if she didn’t then [Haas] would win by default,” Wang said. Zhang said that the Board’s decision to allow Kadakia to run was also based on its previous ruling to permit Student Government Association (SGA) presidential candidate Mario Karras (17Ox, 19B) to run after he failed to submit a declaration on time due to “spotty Wi-Fi,” the Wheel reported on March 20. Zhang said it would have been unfair to prohibit other candidates who also declared late to run in the elections. During the March 22 Wheel debates, Kadakia said that she believed that signing a form at a candidate information session meant that she had formally declared. All students who plan to run in the election are required to attend an information session before they can declare their candidacies. Zhang said that the Board members did not “have as many reasonings [for Kadakia’s case] as we had for Mario’s case,” but it allowed Kadakia to run due to the precedent that the Board had set with the decision in Karras’ case. Wang told the Wheel on March 23 that he expects the Elections Board to reconvene about Kadakia’s case in light of the information about Mutia’s candidacy. Zhang said on March 23 that she might bring Kadakia’s case before the Elections Board again because the Board members now understand that the CC presidential election would have been competitive without Kadakia’s candidacy. The Elections Code does not specify what would lead the Board to re-vote, but the Board may “exercise all powers incident to and necessary for the execution of the [Board’s] responsibilities,” according to Part 2, Article 1 of the Elections Code. Zhang said that she anticipates challenges for the Elections Board’s decision regarding Kadakia’s candidacy and Karras’ candidacy, but the Board has not received any challenges as of March 23. Eligible voters for each contest can file a challenge with the Elections Board by submitting a written complaint by April 2 at 8 p.m., according to the Elections Code. If someone files a challenge regarding the election, the Elections Board will vote on if it will hear the challenge, according to the Elections Code. If the Board decides to hear the challenge, the Board will hear arguments from the challenger and involved parties, the Code reads. If the Board votes to deny the hearing, the Board will vote again within a week if it will hear the case. If the Board votes again to deny the hearing, it will refer the challenge to the Constitutional Council and provide an explanation for why it denied to hear the case, according to the Code. If someone submits a challenge, Zhang said she does not expect the Elections Board to send the case to the Constitutional Council. After the April 1 deadline, any eligible voter may submit an appeal to the Constitutional Council. CC positions do not have deadlines to hear appeal cases, according to the Code. Haas declined to comment in a March 21 email to the Wheel. “The Elections Board has not notified me of this situation and I don’t have any first-hand information surrounding the circumstances,” Haas wrote. Mutia also declined to comment. Zhang and Xu allowed Lee to run for CC sophomore legislator on March 21 without convening an Elections Board vote. Lee declared late because Xu had not sent Lee the candidacy registration form after she expressed interest in running. Lee said she planned to attend one of three mandatory information sessions for candidates on March 7, but the session was canceled due to a University closure. In lieu of attending the information session, Zhang and Xu provided her information over email and Lee emailed them her Emory ID number and NetID, according to Zhang. Zhang wrote to the Wheel that she and Xu “made a mistake of not sending the registration form” to Lee after she submitted her information. UPDATE (3/26/18 at 3:53 p.m.): This article has been updated to clarify that Zhang did not independently verify that Haas was not running against Mutia.